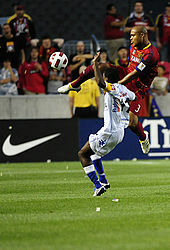 Real Salt Lake (/riːˈæl/), also known as RSL, is an American professional soccer franchise that competes as a member club of Major League Soccer (MLS) Western Conference. 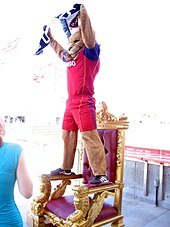 RSL began play in 2005 as an expansion team of the league. The club was founded in 2004 when the club's first owner and founder was awarded an expansion berth in Major League Soccer. Local reaction to the new team's name was initially met with mixed feelings. On top of that, some thought that the name sounded contrived, and did not truly reflect the Salt Lake area, with other suggested team names such as "Highlanders", "Salt Lake SC", or "Union SLC" being more preferred. However, by at least 2014, reaction to the name had improved, with the team establishing its identity as a representative of Salt Lake. As of the 2015 season, Sinclair Broadcast Group holds television rights to Real Salt Lake games that are not aired by Major League Soccer's national television partners. The telecasts (which, until its discontinuation, were originally presented by Sinclair's American Sports Network) feature pre- and post-game coverage. Sinclair's Utah station KMYU serves as the team's flagship station, and telecasts are syndicated to other Sinclair-owned stations in the region, and non-Sinclair stations in Albuquerque, Phoenix and Tucson. In 2018, the team extended its television deal with Sinclair, and announced a streaming partnership with KSL-TV, under which it will offer in-market streaming of RSL's regional broadcasts, as well as Utah Royals FC (NWSL) and Real Monarchs (USL), on digital platforms. This page was last edited on 20 April 2019, at 03:49 (UTC).